Bonfire Night is almost upon us! Toffee apples and jacket potatoes, bonfires and fireworks! Make your Guy Fawkes Night an unforgettable one and forgo the door-to-door begging. If you need to raise funds, take the modern route: print brilliant full-color Event Tickets and publicity on-line. Pre-event publicity encompasses three tiers. 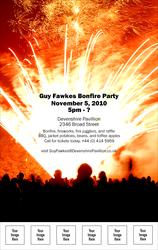 For tightly-focused marketing to an existing mailing list, you can print Guy Fawkes Invitations, just the thing for drawing a proper crowd. Posters and Fliers allow you to advertise to a wider audience, reaching supporters you never knew about. Hang them in shop windows with the owner’s permission, and cover the city centre with your big announcement. General Admission Tickets and VIP Passes allow you to control the crowd, and Drink Tickets are an ideal way to earn a little more money for your organisation. You can sell them in advance or at the event. They keep your queues short and orderly and your vendors at ease. Selling more than drinks? Customise your Event Kit by printing multiple tickets for several sale items! When the weather gets cold, manufacture your own heat. Just start gathering wood and printing Event Tickets. Let your Guy Fawkes bonfire light up the night with traditional treats and festivities, and let your Event Kit design speak for itself. Let’s start at the very beginning. There are those who always know what they’re about, whose ideas flow like wine and always look as sparkling in execution as they do in conception. And then there are the rest of us. Perhaps we’ve found ourselves heading up a committee, and now we must plan a party for young people, or a charity fund raiser. Believing in the cause is not enough. You need ideas! Long before you print your own Event Tickets, you need to plan your event. What do your guests want? Believe it or not, the best way to determine this fact is to act your potential guests. Perhaps you’ve been worrying about hiring the coolest band to play a dance for teenagers. Why not try asking the teens what they want? They may name a local group you can afford, or you may learn that they would vastly prefer a proper DJ, or even that they’d rather you save the money for snacks and simply install one of their own number in the DJ booth with an iPod! The same goes for for charity benefits. Just because your organisation has always held a posh gala in a museum or hotel ballroom does not mean that is the best solution. Start asking questions! You may learn that supporters wish to scale down to a less expensive venue, or that they’d prefer a family-friendly gathering in the park or at the beach. Especially when times are tight, traditional solutions may not be the best. Planning events is hard enough without having to guess at your guests preferences. Don’t just print Event Tickets without thinking things through! Send out surveys over email, ring up some vocal supporters, or add the question to your meeting’s agenda. Give your supporters exactly what they want! We can think of many good things about music! If you’re clever, you can too: it’s a form of expression and communication. It helps joyful times feel more joyful, and it provides a raft that floats you through times of sorrow. In addition, it’s a wonderful way to bring people together. In the spirit of melody, today we examine a few of our favourite music-themed Event Kits. If you love Rock and Roll, there are a few directions for you. Our standard, and most popular, music design is the Rock Concert Event Kit, featuring a horde of screaming fans waiting for that golden moment when their idols appear on the stage. However, we also have a new set of coloured Rock Concert Kits, which encapsulate that moment when the band appears before you. Choose from red, blue, green, or purple! If this doesn’t suit, perhaps you’d prefer an Alt.Chaos Kit for alternative shows, a Natural Riff Kit for unplugged sets, or even the Heavy Metal Kit, for all your head banging needs. Perhaps Rock and Roll isn’t your cup of tea? Have no fear. Our massive online gallery includes a Reggae Kit, quite a few Hip Hop designs, an Event Kit for Gospel concerts, along with Jazz, Swing, Disco, and plenty of Classical Music Event Kits as well. If you’re planning any kind of concert, simply enter your search terms and you’ll find a proper Event Kit for your event! You love Mother Earth and your organisation expresses that love. Why not choose an Event Ticket that lets everyone see the natural beauty of our home? For environmental causes, outdoors events, nature or science gatherings, and festivals with Earth-based themes, we’ve created the Nature Series, complete Event Kits featuring themes from the natural world. For the green of the forest or the blue of the sea, there’s nothing more wonderful than natural beauty. Nature Series tickets are an exceptional way to inspire your customer, benefactors, supporters, and guests. You can choose from the arboreal splendour of the Green Leaf tickets, the cool majesty of the snow-covered Mountain tickets , the halycon tranquility of the Ocean kit, or the stark loveliness of the Desert ticket. You’ll find plenty of other nature-themed tickets in our massive on-line gallery. Try searching “nature,” “flowers,” “butterflies,” “spring,” “summer,” and any other search term you fancy. Or, just scroll through hundreds of designs until you see the one that’s right for you. So love your mother, and show the world how very lovely she is. Choose a nature-themed ticket for your next event and let the beauty of the world speak for you. Create possibility! Event Tickets aren’t merely for theatres and music festivals. Beautiful, custom-printed General Admission Tickets can serve myriad purposes, if only you stop and think about it. These tickets come in several sizes, with or without perforated stubs. Many tickets allow you to add your own custom images right to the ticket template. What creative uses can you put them to? Children’s parties Let your Event Tickets double as Event Invitations. Add the date, time, and location of the party, along with the words “You’re Invited” and other pertinent details and your tickets can do double duty while delighting the kids. Incentives Perforated stub tickets have individual numbers printed on the body and the stub. Why not reward customers with a ticket when they spend a certain amount of money? Then, they can redeem tickets for goods or services, and you can prevent fraud by keeping track of the stubs! Fair share If the cost of admission includes extras like lunch or gift bags, Tickets with stubs can work twice at one event. Tear off the stub when your guest enters, then have them turn over the body of the ticket in exchange for food or prizes. Vanity Use the upload an image feature to make custom souvenirs for parties, graduations, and other memorable event. Just add a head shot of the guest of honor along with the important information and you have a keepsake worth saving. These are just a few ideas. Keep visiting the Event Ticket Printing blog for more tips on getting the most out of your order. Remember, when you print your own Event Tickets, you’re the boss. Put your tickets to work for you! Sponsorship. For many of us, it spells the difference between success and failure. We need underwriters. Partners. Recognizable names to elevate our cause. In the private sector, in nonprofit, and even in events sponsored by the parish or council, a proper sponsor may have the power to turn a one-off event into a yearly function, or a small event into a large one. You can offer potential sponsors a little bit more if you know you have the means to provide them lots of free advertisement in return for their help. Everyone wins: they enjoy the publicity you provide, along with the added bonus of being seen as community boosters. You enjoy the financial support as well as the association with a well-known business. Your Event Tickets can do double-duty! If you choose an image ticket, you can add your sponsor’s logo. Everyone who purchases or merely sees the ticket will view this advertisement. What a brilliant incentive! Sponsors want to see their name in print. Offering to add their logo to tickets and other publicity materials may persuade some to contribute, and may persuade others to make their contributions a yearly donation. Adding logos is almost too easy. All you need is the image file in a .jpeg or similar format. Adding a logo to your image ticket is no different than attaching a file to an email. You click a button, select the file from your computer’s directory, and you’re done! Brand recognition is a powerful force. You can harness it to the benefit of your organisation and your sponsors when you choose to upload a logo to Event Tickets specifically designed for this purpose. How about small events? Family reunions, in-house awards ceremonies, school parties? We’re speaking of events with limited guest lists, small enough to keep expenses down, but large enough that you’re not certain you will recognize everyone’s face at the door. For invitation-only events to which you are not selling tickets, but rather inviting a select group of fortunate guests, consider the following. Here’s a money-saving idea: no-stub Event Tickets. With a slightly smaller format and no perforation, such tickets help you communicate the same information as a full-size ticket. Provided your guests will not need the stub for reentry, small-format stubless tickets will serve you well. In addition, such ticket can save you money by doubling as Event Invitations or save-the-date reminders. They may be smaller, but you need purchase only one per person or family, rather than buying Invitations or Postcards in addition to General Admission Tickets. These small tickets fit neatly into a standard envelope alon with other announcements and information you may want to send. Visualise the difference? Same fabulous design in a convenient, more portable format! Most small tickets measure 108 millimetres long and 56 millimetres wide. Just another helpful hint from your favourite ticket girl! We are pleased to announce the grand opening of our new online storefront: UK Ticket Printing, your source for high-quality, high-resolution Event Tickets for general admission or reserved seating events, plus plenty of matching publicity materials, such as poster and invitations, to keep you looking smart. This site may be new, but we’ve been around the block. We know online ticket printing. We practically invented it! We’ve been at it for well over ten years, so you can choose designs from our online gallery safe in the knowledge that you are working with seasoned professional who can provide exactly what you need for any event. Whether you’re holding a small private celebration or the charity event of the season, our new site makes it easy to select, customise, and order the perfect Event Tickets for your gathering. What’s your theme? We have seasonal, local, holiday, musical, childrens, and automotive tickets, to name a few. Full colour or black and white, simple and unadorned, or elaborate with an option to upload your own business logo, if you find yourself in need of an Event Ticket, you’ll find just what you need in our online gallery of Event Tickets. So please, allow us to invite you into our parlour, where you can sit in your favourite chair and view our collection of original designs. UK Ticket Printing is the clear choice when you print your own Event Tickets.